The Gallery's Redcar Carpet (252cm x 376cm), is a modified version with a red background and was donated by Tony, Philip and Julian in memory of their parents Fayette and Jock Gosse who are descendants of Robert & Joanna Barr Smith. Robert & Joanna were one of the biggest international clients of Morris & Co. The couple had several homes in Adelaide which they decorated extensively with Morris furnishings. The carpet is thought to have been commissioned in about 1890. 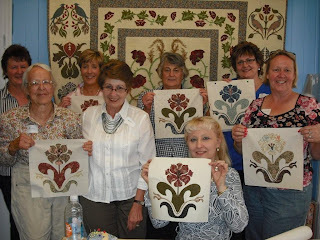 I have been emailing Judy Carrow from Queensland for some time now as we share our passion for William Morris. Judy has been teaching a group of 'kindred spirits' and this is the result of one of their sessions. Go girls - your work is beautiful and I love hearing how you are going via Judy. I feel like I am there with you - isn't it wonderful to keep William Morris alive?!! And James sat down on a brick. I have several friends that are making projects for me - I am so grateful for their unconditional support. Here are three of five girls who are working away with minimal instruction. To watch them select fabrics with their own ideas and interpretation is just wonderful. 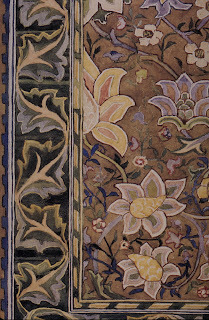 We are all obsessed with William Morris and it brings us together as we share in his amazing designs. Today I was presented with this incredible bouquet of flowers from the students in my class..........something I will always remember. Thanks girls.......you were a treat to teach!